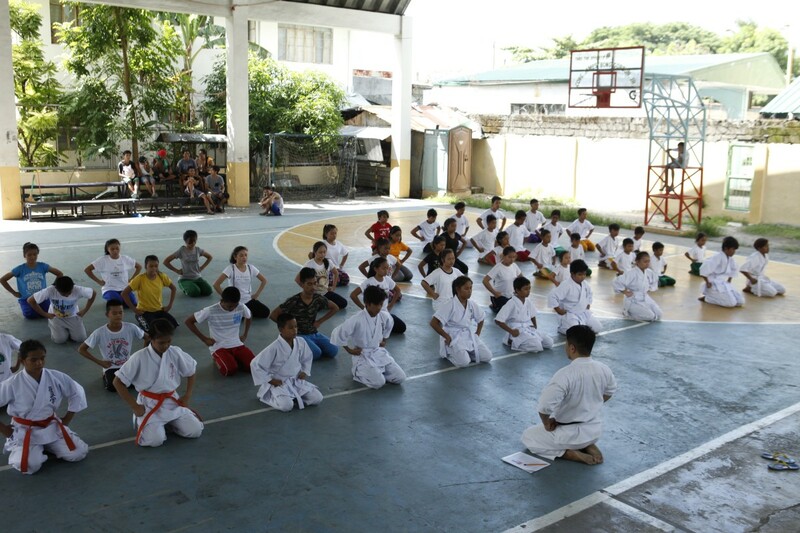 Fifty nine (29 male and 30 female) beneficiaries of ACTION’s Karate no Chikara Project participated in the Karate Promotion Exam held on the 2nd of July 2016 at Brgy. Asinan Covered Court, Olongapo City. The Promotion Exam which is held every 6 months is conducted to gauge improvement in the Karate skills and techniques of the children. The examiner was no other than ACTION’s President and founder, Senpai (teacher) Hajime Yokota. He also demonstrated the use of karate techniques in self-defense. Karate no Chikara instructors, Mr. Jim Rabaca and Mr. Joshua Maquiran assisted Mr. Yokota in the demonstration and led the warm-up exercises. Afterwards, the group proceeded with the Kata presentation. Kata are detailed choreographed patterns of movement, composed of Karate techniques, although it is a term widely used in martial arts in general. Students from each level (as determined by belt color) performed one after another followed by new students who are yet to earn their uniforms. Students with orange and blue belts paired up to demonstrate some techniques in self-defense. One of the candidates for promotion was Mr. Mark Jonathan Vargas, a former Karate instructor of ACTION. His skills were tested in separate bouts with Mr. Jermel Valdez (another candidate) and the 2 Karate no Chikara instructors. All of the new students got promoted. They will be receiving their uniforms in August. On the other hand, the others are still waiting for the decision of Senpai Yokota.